Scotty McCreery announced on his social media this morning that he will release his new song “Five More Minutes” this Friday, May 5. Fans will be able to purchase the song at digital retailers (including iTunes and Amazon) and listen to it through online streaming services. 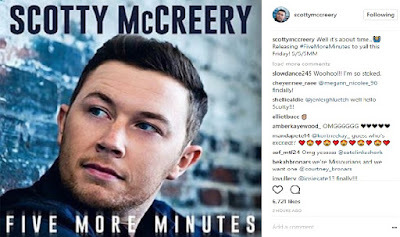 McCreery shared the news on his Twitter, Facebook and Instagram this morning, posting the new single artwork and answering questions from fans. "’Five More Minutes’ is probably my favorite song I’ve ever performed and definitely my favorite song I’ve ever written,” said McCreery. McCreery wrote “Five More Minutes” with Frank Rogers and Monty Criswell. The song, produced by Rogers, was written two weeks after the singer’s paternal grandfather passed away in 2015. The ACM, BMI and CMT Award winner performed it on the Grand Ole Opry in June 2016. The video of that performance was added to the Opry’s YouTube Channel and quickly became a fan favorite, earning McCreery the fan-voted Rare Country Award for Grand Ole Opry Moment of the Year. “Five More Minutes” has also become a cherished moment in concert as well, always earning McCreery a standing ovation from the audience. “Five More Minutes” will be out this Friday, May 5.